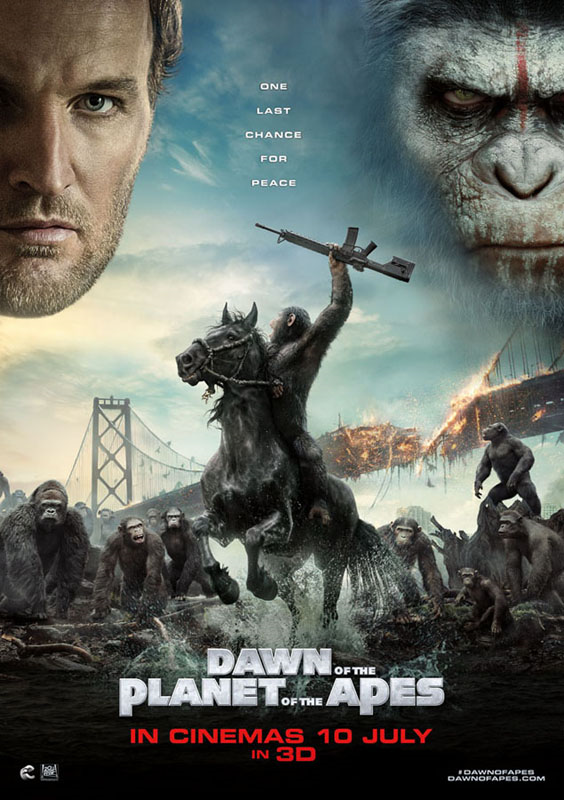 The story in Dawn of the Planet of the Apes continues to move towards the eventual fate of the world shown in the original 1968 adaptation of The Planet of the Apes. This sequel takes place “10 winters” after the events of Rise of the Planet of the Apes (2011) where the evolved apes led by Caesar (played by Andy Serkis) have built and grown a large peaceful community in the woods of San Francisco while the humans are almost completely wiped out by the virus spread (remember the ending of the first film?). Both species crossed path again when the desperate human survivors nearby traveled into the forest looking for the hydroelectric power station in hopes of restoring electricity to their own community back in the city, but major conflicts arise when insecure and grudge-filled “bad apples” of respective parties make things unnecessarily complicated, triggering a war between apes and humans for the power to rule. This is perhaps one of the most emotionally engaging film of all time for me, it got me eyes teary in many scenes. The film’s patient narratives (film is directed by Matt Reeves this time) backed by tear-jerking music score (by Michael Giacchino), satirical story with moral values (solid screenwriting by Mark Bomback, Rick Jaffa and Amanda Silver), amazing visual effects (Dan Lemmon and Joe Letteri) and cinematography (Michael Seresin), constant tension and absolutely brilliant ape-acting performance make all the cliched and predictable convenient moments in the second half immediately forgivable. When you watch the movie, look out for that awesome one-shot sequence with the tank. Oops, is this considered a spoiler? Ah, just by watching the trailer, you’d know there’s going to be good action and war scenes between man and monkey (it’s actually more than that! ), and it’s epic indeed. The strong performance by Andy Serkis as ape leader Caesar is just so powerful and heartfelt that I think he has made Caesar the best animated character in a live action movie in film history. 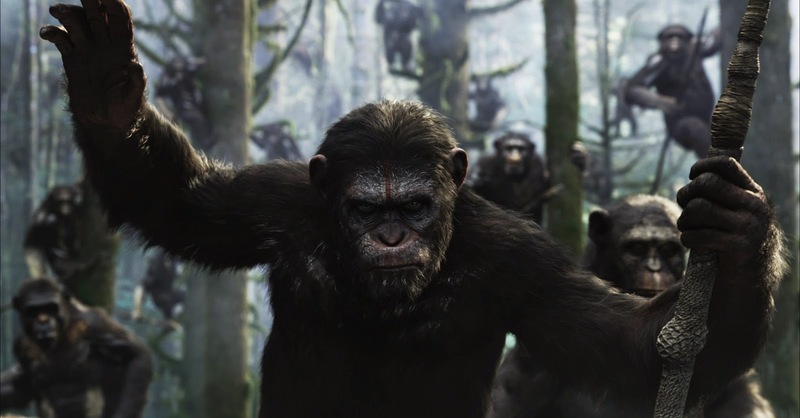 Toby Kebbell who plays Koba, and the rest of the cast who play the other ape characters are also absolutely impressive. They may be CGI, but the performance of the actors, including facial expression, are completely captured by computers. Not to mention how convincing their movements and behaviour as the animals are. And they filmed all this in a forest, I doubt any production has ever done this before, and done it so darn well. Jason Clarke’s performance as Malcolm does enough as the good guy role from the human side who forms a bond, trust and mutual respect with Caesar. The only disappointment in the actor-character department is the lack of screen time and development for Gary Oldman’s role Dreyfus, the leader of the human survivors in San Francisco. Why waste such a great actor for a such a minor character? Malaysia censorship: Nothing seemed to be cut at all for the media screening held at TGV Sunway Pyramid. Second opinion: My girlfriend thought the film’s awesome as well. Verdict: A sequel with a purpose, that didn’t disappoint. Hands down, one of the greatest summer blockbusters of 2014, within my personal top 3 list at least. Without a single doubt it's better than Michael Bay's garbage.